Who doesn’t like the taste of coffee on a lazy morning or cold winter nights? Some of us can even indulge in the bitter-sweet goodness any time of the day, right? However, running to a nearby café or seeking a luxurious taste each time in instant coffee can sometimes curb the appetite. Well, why not invest in an automatic coffeemaker then? A great idea indeed! For the love of coffee, we have compiled this guide just for easing up your buying decision. So, browse through the reviews of these carefully-selected coffeemakers with grinders, select one, and pour yourself to a cup of hot, aromatic and full of flavor coffee at any time of the day. Note that all the models picked by us are priced under $100 so as to ensure a convenient yet inexpensive mean of satisfying your coffee cravings. Read away! Coffee lover, are you? If so, then drinking several cups of the brew every day must be normal for you. Are you looking for an affordable way to get freshly brewed coffee whenever the craving arises? Bring home the Cuisinart DGB-550BKFR, and let the automatic coffee machine work its magic. Read more about its features below. With a black and stainless steel finish, this cubic-shaped coffeemaker has a stylish appearance, while its compact size makes it easily adjustable anywhere on the countertop. Besides the efficiency of machine in terms of coffee making; you are going to be wowed by its sleekness as well as its brushed metal surface. Not only is this model highly desirable for any modern kitchen, but it comes with a 12 cup carafe, which is made of transparent glass and features an ergonomic handle as well as a knuckle guard and drip-less spout. The coffee produced by this machine has a highly pleasing taste and aroma. Fresh flavor of the beverage is guaranteed, thanks to the water purifier that helps in eliminating chlorine, bad tastes and odors from tap water while the coffee is being brewed. In case your preference is in using pre-ground coffee, you can use the option of switching off the grinder. 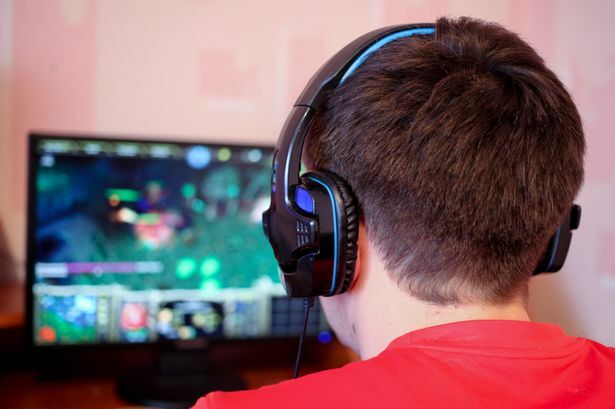 Moreover, the 24-hour programmability of the appliance is amazing, as it gives you the advantage of treating yourself by a cup of freshly made coffee at any time of the day. Won’t it be delightful to get hot coffee first thing in the morning, effortlessly? Besides, you can always remove the carafe safely from the unit for pouring out a cup instead of waiting for the whole pot to get ready. DGB-550BKFR is one of the best coffeemakers available as it is capable to brew up full bodied and delicious coffee for you in minutes. Besides, the unit is equipped with a permanent filter, a charcoal water purifier and a built-in grinder that lets you enjoy high-quality coffee even at odd timings. Before brewing a fresh and aromatic pot of hot beverage; the whole beans are automatically grinded, and you can also use the grind-off option to pause the brewing process and pour out a cup for yourself whenever needed. Moreover, it is fully programmable for a 24 hours usage, and has an adjustable auto shutoff too, which can be set from 0 to 4 hours. The separate grinder chamber and filter area makes cleaning the unit very easy. A perfect 7 compact coffee maker and grinder combo that offers 12 cups coffee. 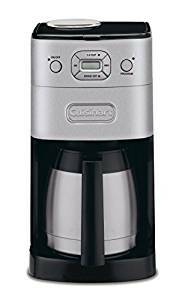 Cuisinart dgb-550bkfr automatic coffee maker is fully programmable with adjustable auto shutoff. it can automatically grind beans before brewing too thus making it the only coffee maker you will ever need. Life can get pretty hectic sometimes, but there is always time for a hot cup of rich coffee. 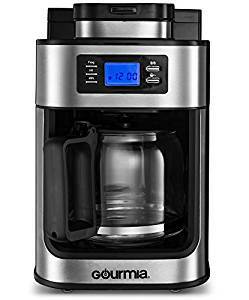 If you are looking for ways to save some time and sit down for a relaxing coffee break; we recommend buying the Gourmia GCM4700 Coffee maker instead of manually whisking the latte every time. Scroll down to glance over its features. With such a sleek design of this coffeemaker, you will be amazed by its durability and performance. This stylish model is a 1050 watt powerhouse that accommodates a capacity of making 10 cups of coffee in one time. It has an attractive, yet strong stainless steel body for protection against rust and wear and tear. The clear glass carafe with an ergonomic handle for an easy grip is highly commendable too. Also, you can forget about ruining your table runner or kitchen counter by splashes of accidentally-spilled coffee, thanks to the drip-free spout of the coffeemaker. Gourmia aims to make everyday cooking easy and delicious, and this coffeemaker from the said brand is a perfect example of this. The model is not only innovative, it also delivers a high standard of performance and value to its buyers. It will make your life in the kitchen fun and coffee cravings convenient as this unit combines a powerful grinder and drip brewer to produce the richest-flavored coffee you can ever ask for! Moreover, you will be able to grind your own beans or utilize pre-ground ones to suit your preference, and conjure up a fresh cup of coffee. You are going to love the ease of using this machine. It has such simple controls that are bound to save you some precious minutes whenever you feel like brewing up some coffee for yourself or your guests. There is a large LCD display and buttons for the quick grinding of beans, and brewing up the mixture along with easy programmable time settings so you can get coffee at any particular time of the day or night. Besides, you can take your own sweet time to complete chores or sing in the shower without the coffee turning cold and bland. Yes! This model is capable of keeping your coffee fresh and hot for up to 30 minutes after the brewing cycle stops. What else do you need? This Gourmia coffee maker with grinder is a perfect combination of performance and design. It features a powerful grinder and brew the richest coffee. It has an LCD for easy functions and operation with programmable time settings. Coffee lovers never like to compromise on the taste of their favorite beverage, after all, it gives them the power to sail through a rough day. If you are one of such individuals, then an impressive automatic coffeemaker is what you definitely need! Look no further because the French Press Coffee Maker & Burr Grinder Bundle by Venoly is at your service. Keep reading to learn why! This coffeemaker will surely leave a great impact on your life, provided that you are a frequent coffee drinker! The machine is manufactured using the finest quality materials in order to ensure long-lasting performance and customer satisfaction. It has a tight fitting stainless steel lid that prevents spillage and seals in every bit of flavor so that you get to drink the best-tasting coffee ever! Also, the borosilicate glass is very sturdy and crack resistant, hence making the model quite durable. The French Press Coffeemaker is not just your regular coffee machine, it actually boasts of multiple uses. Yes, that’s right! The versatile French press allows you to brew loose leaf teas, froth some milk, cuppucino, a glass of hot chocolate and much more. You can sip to your delight whatever you want to! Besides, if your intention is just to savor coffee, then you would be pleased to know that this model comes with a manual conical bean crusher that has a stainless-steel body and a ceramic burr, but best of all, it features 18 grind settings! So now you can choose how fine or course you want your coffee to be. Amazing, no? Furthermore, its double-filtered brewer ensures that you never end up with coffee grinds in your mug. Other extra tools that come along are replacement filters, stainless steel and plastic spoons and a cleaning brush. Venoly has always been a brand that provides unmatchable commitment to quality, and brings excellence into your kitchen effortlessly. This beautiful unit is yet another innovation that lives up to the standard. With so many benefits, you might think that operating this beautiful coffeemaker may be quite a task. Well, fret not! The machine is not only very simple to use, but equally easy to maintain. It is rust and dust proof as well as safe to be put in the dishwasher for convenient clean up. Remember, even culinary experts agree that coffee prepared in a French press is the most luxurious in terms of flavor and aroma! This is a manual french press coffee maker & grinder bundle which you can use to make a perfect cup of coffee. Although its upto personnel preference, however its been noted and recommended by many that manual coffee grinders offers the best taste of coffee. Also its more affordable compare to automatic coffee makers. Mr. Coffee is a renowned brand name in the coffeemaker industry, and has been crafting products to help customers in brewing coffee effortlessly since 1970. If you find yourself longing for a delicious cup of this rich hot beverage every now and then, we recommend to get your hands on this single-cup coffeemaker with built-in grinder. Want to know about this model? Scroll on! The said machine is BPA-free and made of stainless steel. Also, it is aesthetically appealing and lightweight too so you can easily place it on your kitchen counter or move it around if you wish. Apart from this, cleaning the machine is very simple as it is dishwasher safe, and the filter basket can be lifted out for a good quick wash. Guess what? It even includes a double-walled travel mug, enabling you to dispense your coffee right into it so that you can sip on the go! According to experts, if you want to experience the taste of the freshest coffee, you should grind beans right before brewing. This model has been designed while keeping this exact fact in mind, and flaunts a built-in grinder for user convenience. Whole beans are instantly transformed into fresh grounds so you can select from the two options of brewing. One is to grind and then brew or directly brew with traditional ground coffee. Either way, a satisfactory cup of flavorful coffee is guaranteed. Moreover, the brew sizes can be adjusted up to 16oz, making it just perfect to fill large coffee cups or travel mugs. The one-touch operation of this unit makes it easily usable even by a novice, and you can enjoy splash-free brewing of rich-tasting and full-bodied cup of coffee in just 15 seconds, or probably even lesser! It has an adjustable cup tray to accommodate different cup sizes too. Now, you can happily brew up your preferred beverage in a quick, affordable and hassle-free manner. 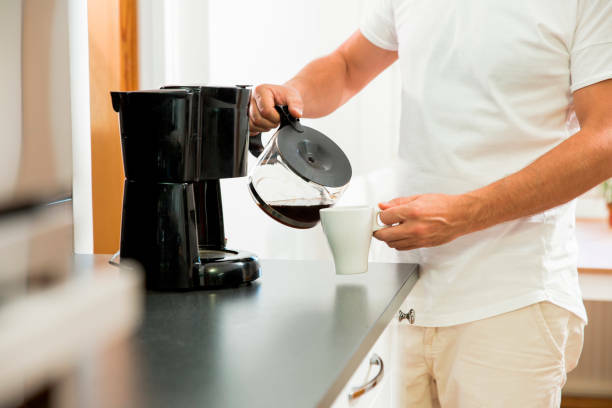 In short, all you have to do when a coffee craving arises is to, turn on the machine, put in some coffee beans or ground coffee, let it brew, and finally pour the fresh mixture into your favorite mug! A perfect one cup coffee maker with grinder that can instantly transforms whole beans to fresh grounds. This Mr. Coffee single cup coffee maker is a perfect combination of efficiency and affordability. It is built with stainless steel and comes with a travel mug making it an absolutely perfect choice if you are looking for single cup coffee maker with grinder. Are you tired of running to a coffee bar each time you crave for some? Or is the on and off purchase of instant coffee is gradually digging a hole in your pocket? Well, here’s the good news! Now you can treat yourself to excellent coffee, and that too quite economically. How? Simply by buying the Cuisinart DGB-650BC Grind-and-Brew coffeemaker! Read on to know its interesting features. Not only does this device grind whole beans to produce coffee that is full-bodied and rich in flavor; you will be able to drink your favorite beverage any time you wish, and freshly brewed each time! It boasts of a double-wall thermal stainless steel carafe, which helps in keeping the coffee hot and fresh for hours. Besides, its stylish design adds to the beauty of all types of kitchens, modern or new alike. Also, the reservoir cover with release button flips back to enable easy filling of water, and access to the grinder compartment. There is a showerhead too, which ensures that water is distributed evenly over the coffee, and temperature loss is minimized as the water flows through grounds. This model allows you to wake up to the irresistible aroma of freshly ground beverage, thanks to its expert coffee-making technology. It is a 10-cup automatic machine that comes with a built-in bean grinder, and is fully programmable around the clock with an auto shut off option. In addition, the machine also offers options like brew pause to sneak away a cup of coffee before the brewing cycle ends, a grind-off feature in case you prefer pre-ground coffee, and a 1 to 4 cup setting to make smaller amounts of the brew. The measuring scoop and instruction booklet are further handy items that are included within the package. Since this coffeemaker is fully automatic, it is very convenient and simple to use. It features a separate grinding assembly to ground beans easily before brewing the coffee, whereas the existence of a filter chamber enables the user to add beans, and remove the ground ones quickly. Moreover, the model has a large control panel with a friendly-user interface for convenient coffee making. It also entails a stay-cool handle and a spout, which enables drip-free pouring. Besides, charcoal water filter as well as a permanent gold tone filter are also there to ensure that the users are presented with the freshest coffee flavor each time a cup is poured out. Excited to buy it already? 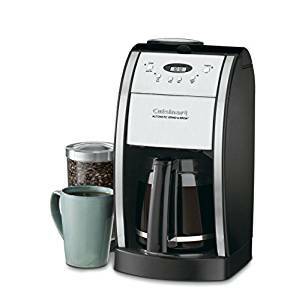 The Cuisinart DGB-650BC s a 10 cup thermal automatic coffee maker that offers the functionality of both grinding and brewing. It is a fully programmable coffee maker with auto shut off feature. Its double-wall thermal stainless-steel body keeps your coffee hot and fresh. With so many coffeemaker brands flooding the market, finding the model that would cater to your needs in the perfect manner can be quite tricky, especially when every brand out there promises amazing results. The mentioned-above models made it to our list because of their gorgeous body, efficient performance, ease of use and affordability. So, which of these do you plan to buy? Hurry! There’s nothing more comforting than freshly brewed homemade coffee that doesn’t require endless grinding, and whisking up some delicious froth manually!